Toompea or "Upper Town" is the home of some of Tallinn's oldest architectural wonders and home to Palace Square. Visit a historic Russian Orthodox Cathedral. Alexander Nevsky Cathedral serves as the dominating landmark in Palace Square. Witness the cathedral's cupolas and golden crosses rising high above the rooftops. 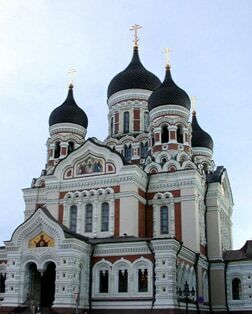 Called the "Dome Church" by the locals, St. Mary's Cathedral is the city's oldest church and an architectural landmark that has played a prominent role in Tallinn's history. Lower Old Town boast views of Toompea Hill and the famous Town Wall dating from the 13-14th century. Stop in Town Hall Square for views of the Gothic Town Hall and browse the small shops. The Town Hall was built in 1402 as a meeting place and has been a highlight of the city ever since. Founded by Peter the Great, the palace's main hall is one of the best examples of Baroque architecture in all of Northern Europe. Since the Russian Revolution, the ornate palace rooms have been used as part of the Art Museum of Estonia. One of Tallinn's most impressive defensive structures (also known as "Fat Margaret"). The origin of the name is a mystery: some say it was named for a large cannon, while others claim a cook called Margaret once worked here. A small, provincial town halfway between Tallinn and the border at Narva, Rakvere is home to the ancient Tarvanpea Castle Ruins.